The Aloe Vera is a popular plant in many different cultures, and is often used in pharmaceutical and cosmetic. Here in El Cotillo at Fuerteventura it is a favored product, which grows here nearly everywhere. It is a desert lily, which is also known as a medical plant, and contains ca. 200 active ingredients. The gel, which is extracted from the leaves, acts curative and anti-inflammatory. You can use it against sunburns, insect bites, allergies etc. In the medicine, it is used for example against cough and also against many other illnesses. The gel is also used in cosmetical products, like in crème because it contributes a lot of moisture. The plant is very easy to care. The only things that it needs are a lot of sun, warm and constant temperatures and a little bit of water – but not too much. When the plant is about three years old, it has enough active ingredients and you can gather the gel out of the leaves. 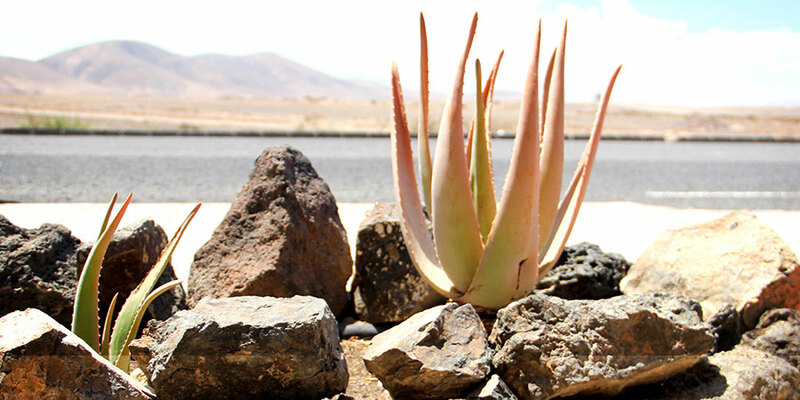 At Fuerteventura the Aloe Vera grows very often, and is usually used here. Here in the north are many stores which sell different Aloe Vera products. If you get a sunburn while surfing at Fuerteventura, for sure you will find a right product to treat it.